UPPER DIR: Polling is currently underway across the country on Wednesday and women in Upper Dir have stepped outside to cast their votes for the first time in the area. It was reported that long queues of women were formed outside polling stations in NA-5 and PK-12 constituencies. The Election Commission of Pakistan (ECP) had earlier said that any area where women are stopped from or face hindrances in voting could face the election in its constituency becoming invalid. Furthermore, the ECP said the results of any constituency would be declared invalid should the female turnout be lower than 10 per cent. Any person found involved in or facilitating such a deal may face up to three years in prison. Earlier, two provincial chapters of the Election Commission of Pakistan (ECP) also stated that any area where women are stopped from voting or face hindrances during the election could face disqualification from the election in its constituency. 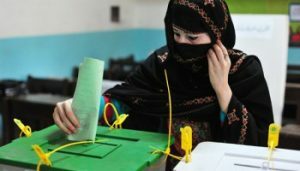 As the country prepares for elections on July 25, the ECP’s Khyber Pakhtunkhwa (KP) and Balochistan chapters took notice of some reported deals that had been made to not allow local women to vote.